I love hard-boiled eggs. Especially when they are cold and sprinkled with just a smidge of salt. Mmmmmmm. Reminds me of picnics with my sister and our next door neighbor, Cathy, when we were little girls. We would picnic in either our backyard or Cathy's and my mom would send us out with hard-boiled eggs and bologna and lettuce sandwiches. A true feast for a small child!!! For another way to hard-boil eggs, begin as directed at left with the eggs in cold water, but once the water reaches a brisk simmer, turn off the heat and let the eggs sit uncovered in the hot water for at least 10 minutes and up to 30 minutes— the water cools gradually, preventing the eggs from overcooking. This is a great method when you’re multitasking and can’t pay careful attention to the eggs. This works perfectly for me everytime!! This is exactly how my mom taught me to do it. Just like rice too. Walk away and leave it alone. Thats so funny...I was thinking about making some today! Love a hard boiled egg for breakfast and then leftovers made into egg salad for lunch. Yum! I just learned this a few months ago. It works great! I actually learned this trick from a Martha Stewart tv episode. Oooooh, now you got me craving this! I'll join your picnic! Loved your blog. Your daughter is precious! I am a pastor's wife too. I will say that while I love the idea of decorating, I just can never seem to make up my mind....it took me forever to choose a paint color. Decorating isn't my thing but I love reading BH&G magazine! So funny! I have to take out my Betty Crocker cookbook every Easter to remember how do do these for egg dying! Another trick for easy peeling is to use eggs that are erm... 'not just purchased'! 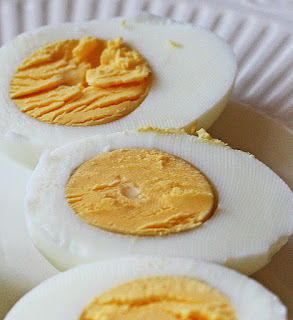 I love that - hard-boiled eggs for a children's picnic. I never would have thought of that. Going to keep that in mind for the impending spring.